Why would people think Metafilter censors posts critical of police? Since tweets are being linked to or quoted more often than before, especially in the politics threads, I think there is a need to come up with a way to standardise these quotes/links. It could be either just a preferred in house convention or an addition to the buttons that are there below the comment box. Might also need to consider how to quote a thread of tweets or multiple tweets. What does MeFi think? On iOS, Chrome seems to work better than Safari for very long posts. Burt Reynolds reveals the strangely apropos meaning of "hamburger" from the set of Smokey And The Bandit: And Jackie drank on set, sometimes before 11 AM. He’d look over his shoulder and say “Mal! Hamburger!” And that meant glass of bourbon. Whenever he said “Mal! Hamburger!” that meant go get me a tall glass of bourbon. Howdy! So, scrolling through the video game trailers post, I noticed there's quite a few resident gamers here in MeFi. Which made me wonder: Does metafilter have it's own Discord channel? I think it might be a good idea. It would be a good place to banter about politics while queueing for some Overwatch or whatever, and avoiding the casual racism and misoginy that permeates most multiplayer games. For those not in the know, discord is a low latency voice and text app designed for gaming. It's pretty good. In 2009 (when I had the appendage to my account name), I asked for help identifying a soda we used to buy at the co-op in Austin, Texas in the late 80's/early 90's. 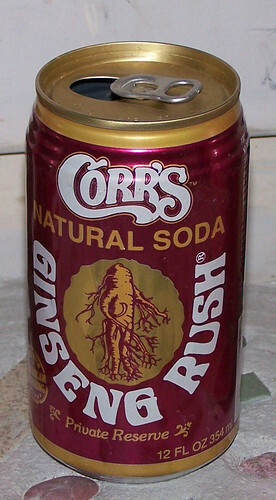 This weekend, my spouse found it on the internet: Corrs Natural Soda Ginseng Rush, as discussed in this Chicago Reader article from 1993. Have you resolved any lingering Ask.Mes lately? Holy Uncanny Diagonal Lines, Batman! Trying out two Ask MetaFilter questions per week! It got me thinking about the various online communities I've been a part of in my digital life, the different digital phases I've posted, shared, & tweeted my way through. Where does MetaFilter fall into your own digital history? What is your online genealogy? Why allow blocking private messages? For the first time, I just had another user block my private messages after a polite but heated exchange where I guess they just really wanted the last word. I'm not like offended, but I had never noticed the option to block private messages before, and was wondering what the rationale is there. If someone is spamming or harassing another user, that seems like something that could be resolved through the mods. Is this something that has always been there, and do people use it all the time and I'm just out of the loop?